This year, I made three desserts to take to my in law’s house for Thanksgiving: lemon cake, chocolate pie, and apple pie. I am especially excited about the apple pie because it was my first one! It was so easy, I don’t know what took me so long. But I have to admit that I planned to make the crust from scratch and ended up using a Pillsbury crust… so I still need to conquer that goal! This is literally the easiest pie ever. Three filling ingredients: chocolate pudding mix (1 large box), milk ( 2 cups), and whipped cream (1 cup). 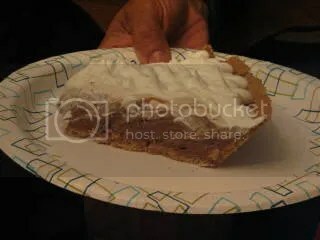 Whisk them together and throw them into a large graham cracker crust and top with more whipped cream. Set in the refridgerator for a at least a few hours. I made this a couple years ago for Thanksgiving and everyone liked it so my mother in law asked me to make it again. I did a lot of searching for the perfect apple pie recipe. My mom is the queen of pies. So, when she suggested this Paula Deen recipe, I stopped looking for one. It calls for a crumb topping but I didn’t make it. Instead I brushed the top with milk and sprinkled sugar over it, which is what my mom does. It came out beautifully! It browned nicely and was done in about 55 minutes. Line a 9-inch pie pan with half of dough. Combine the sugar, flour, cinnamon, and salt in a bowl. Stir in the apples, applesauce, and lemon juice. Spoon the apple mixture into pie pan and dot with butter. 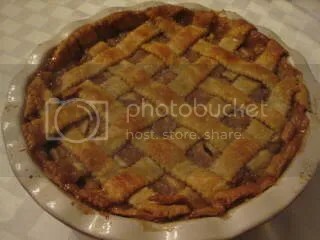 Cut remaining crust into strips; arrange in a lattice design over top of pie. Brush with milk and sprinkle with sugar. Bake for 10 minutes, then reduce heat to 350 degrees F and continue to bake for about 45 minutes, or until crust and topping are golden brown. Your Turkey cake is adorable! Everything looks fantastic! : ) Hope you had a great Thanksgiving! 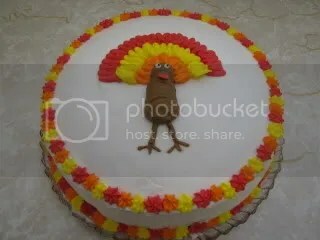 Everything looks great, but I LOVE the turkey cake! So cute! Those pies are gorgeous and that cake is TOO CUTE! 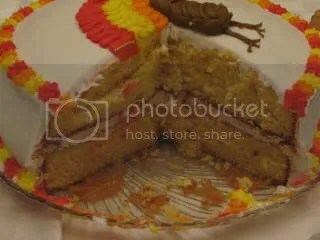 WOW GREAT CAKE. I JUST BOUGHT A DESSER DECORATOR BY WILTON AND NOW CANT WAIT TO USE IT! You are the queen of desserts. 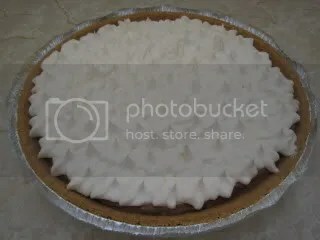 I love how you did the whipped cream on the chocolate pie. Did you pipe it?